(BPT) – As international travel gains popularity each year, new destinations are added to bucket lists and new travel gadgets and accessories appear on the market. The way we travel has changed in the past few decades, but that age-old itch to explore and discover new places and experiences remains the same. So how and why are people traveling now? The results of Visa’s recently released Global Travel Intentions (GTI) Survey reveal some interesting travel trends – and tips. Simplifying payments abroad – For as long as anyone can remember, a standard part of traveling to a foreign country involved exchanging currency. Carrying cash involves time, planning, anxiety about losing money and often, wondering what to do with leftover cash once you return home. In fact, loss or theft of cash is the number one money concern for travelers while on trips. And 72 percent of people say working to get their hands on foreign currency prior to departure is a waste of time. With more than 46 million merchants accepting Visa around the world, a Visa card is the most important travel accessory you can carry. People travel because of culture – Of all the places to go in the world, why is it some people choose one place over another? According to Visa’s GTI survey, 41 percent of people cite “rich culture” and “friendly locals” as reasons to pick a destination. Although famous monuments, great museums and spectacular palaces continue to draw in visitors, the people who live in a traveler’s destination are hugely important. TIP: Hang with the locals. Check out fun events such as festivals and concerts to make sure you’re not missing the best events in the city you’re visiting. And don’t forget local flavors of the country’s national dishes. Ideal vacations look a little different to everyone – What do you want to get out of travel? Is it to meet new friends, see something in person you saw on television, or fulfill a longtime dream? When vacationing, 63 percent of travelers are motivated by a combination of reward and achievement. That means to them, an ideal vacation has some combination of relaxation and experiencing new cultures or exotic locations. TIP: Block out time on your trip to relax and reflect on the experience. It can be easy to plan activities and sights to see, but it’s important to rest in between. People are feeling optimistic about travel – Though they may be excited to get out of their comfort zone, some people have reservations about the safety of traveling to far-off locations, or worry about affording such a trip. However, according to the GTI Survey, people are not letting these factors keep them at home. Globally, only 17 percent of people cited security as a top concern and only 19 percent chose a destination because it fit their budget. What that says is that people are willing and eager to visit their dream destinations. Technology is the new travel companion – The traveler’s well-folded map and dog-eared guidebook might be a thing of the past. As more travelers adopt digital technology, virtually everything they need to navigate fits right in the palm of their hand. What’s more, 88 percent of travelers have online access while abroad and almost half, 44 percent, use ride-sharing apps to get around once they are on the ground. Staying on top of trends can allow travelers to plan accordingly. By budgeting, planning, avoiding cash and finding out the best ways to track spending, travelers can get the most from their dream travels – and their wallets. (BPT) – Whether a fancy five-course social event, a laid-back barbecue or a progressive dinner party, what separates average from impressive entertaining is innovative and original ideas. One way to surely catch the attention of your guests while tempting their taste buds is to feature chocolate pairings in your entertaining itinerary. Fine chocolates add decadence to any event, but they are relatable and broadly enjoyed. Chocolate platters have replaced cheese platters at soirees, but what’s really on trend for 2018 is chocolate pairings. This interactive offering is a conversation starter that will delight guests – the perfect way to conclude a meal with friends or family. While the idea of chocolate pairings might seem complex, it’s actually quite simple. These tips from the expert chefs who create Kohler Original Recipe Chocolates will make it virtually effortless to pair fine chocolates with beer, wine and spirits so you can impress guests at your next event. Offer an array of flavors. To ensure you have something for all guests no matter their preferences, opt for a variety of chocolates. Selections from the white, milk and dark chocolate categories offer an array of flavors. Some guests may gravitate to one over others, while other guests may choose to sample all three varieties. Suggest sampling from light to dark to balance the palate. Pairing 1 suggestion: White chocolate. White chocolate is sweet and buttery, integrated into numerous types of confections, many of which feature fruit. The Kohler Cranberry Terrapin showcases cranberries and white chocolate with its signature smoky caramel. Cranberry and white chocolate are delicate flavors and this piece is crafted so that those flavors balance well and are not overpowered by the smokiness of the caramel. With that in mind, consider serving with a a stout beer that will bring out that buttery goodness. If selecting a wine pairing, opt for a zinfandel or another variety that won’t overpower those delicate flavors. Spirits can be a nice pairing addition, too. A classic bourbon complements the smoky caramel perfectly. Pairing 2 suggestion: Milk chocolate. Americans adore milk chocolate and expert chocolatiers can transform this delight into virtually endless tempting flavors. The Kohler Butterscotch Hop is one such example. The smooth, creamy butterscotch filling is enhanced by a custom blend of premium chocolate to elevate this flavor combination. It’s velvety on the tongue with a light finish, plus the beautiful mold impresses the eye. Milk chocolate is smooth and sweet, and drink pairings should complement that element without overwhelming. A light crisp beer or a refreshing chardonnay brings out the buttery undertones of silky-smooth milk chocolate. If you decide to serve butterscotch, it’s sure to be unique as it’s a pretty rare find in the chocolate world. A honey whiskey is the perfect pair for butterscotch chocolates. Pairing 3 suggestion: Dark chocolate. Rich and undeniably decadent, dark chocolate is the ideal final pairing to offer guests. The flavors of coffee and dark chocolate are often fused together as they mingle together well. 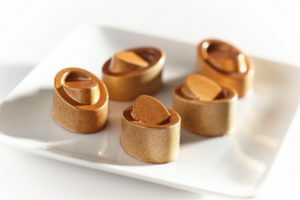 For example, the Kohler Caffé and Cream has dark chocolate coffee ganache with a layer of creamy mascarpone in a dark chocolate shell. This multi-layer chocolate is meticulously crafted and offers a burst of satisfying richness. Serving – You can serve chocolate pairings in a variety of ways. If you prefer to set up a beautiful buffet, you can display chocolates on a platter and place drink pairings nearby, each labeled appropriately. Guests can help themselves at their leisure. You may also opt to serve guests by bringing out each pairing one by one and offering guests their choice of beverage to pair with the featured chocolate. No matter how you choose to serve, it’s bound to be a memorable moment at a fantastic event. (BPT) – Many people long to see another part of the world but are reluctant to travel on their own or take on the stress of planning a vacation. Researching destinations, transportation, accommodations and activities can be a lot of work. 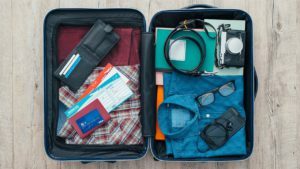 Expedia research has shown that leisure travelers visit an average of 38 websites to get information and compare prices before finalizing their plans. If this sounds especially daunting, you’re not alone! To attain that freedom, Menge recommends joining a travel club that offers pre-planned group vacation packages. Group travel provides an opportunity to meet people who enjoy similar activities, and the curated offerings of a travel club relieve the stress of planning every aspect of a trip on your own. Not only do you have an easier way to book your next trip, you also get to create long-lasting memories with a new group of friends. Myth No. 1: I’ll be lonely. While a few in your group may already know each other, plenty of others will arrive solo, looking to meet new people. Unfamiliar settings have a way of bringing strangers together. In fact, a story in The Atlantic magazine revealed that people who share experiences are happier than those who experience things alone. Between sightseeing and sampling foreign delicacies, friendships flourish naturally between group members. Myth No. 2: I’ll have to do everything en masse. While there’s typically an itinerary outlined for the entire group to follow, you’re free to explore with a smaller group or on your own. One of the best ways to form new friendships is to connect over shared interests. If you and a few others want to see the same play or museum exhibit, go together! Myth No. 3: It’s too expensive. Traveling with a group can actually help you save money. As part of a group, you can share food and transportation, and purchase reduced admission to popular attractions and activities. According to timeshareadvocates.org, vacation clubs present a good option for group travel because they offer value-packed trips at discounted rates to their members. One example is DreamTrips, an award-winning travel and leisure club where members enjoy professionally curated travel opportunities and valuable deals at select restaurants, hotels, excursions and entertainment venues all over the world. Still unsure? 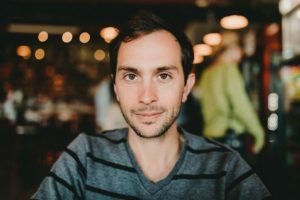 “It is an amazing privilege to be able to travel the world freely, to be able to see different countries and experience new cultures,” says Menge. “When we meet and speak to those around us, it will only serve to enhance our journey. Go ahead and talk to your fellow travelers … Talk to strangers. I promise it will make you feel more connected and more present while you travel.” What are you waiting for? Put yourself out there. Find the vacation club that best fits your lifestyle and book your next getaway today. (BPT) – There’s so much to love about an outdoor wedding. Whether it’s set on the beach, at a winery or even in the backyard of a family member, pledging your eternal commitment to your partner in beautiful natural surroundings makes the day extra memorable. If you’re thinking of holding the big day in the great outdoors, you’re in good company. Over the past decade, outdoor ceremonies are on the rise: 52 percent of couples tied the knot in an outdoor ceremony in 2017, compared to 29 percent in 2009, according to the TheKnot.com’s 2017 Real Weddings Study. Couples are also shying away from churches, hotels and banquet halls as settings for the ceremony receptions and opting instead for less conventional sites, such as rooftop event spaces, historic homes, wineries and parks. * Sketch out the itinerary early: Before you sign the contract with your chosen venue, discuss in detail your vision with the coordinator, and before you leave, be perfectly clear on what’s permissible and what’s off-limits. If you’re envisioning dancing the night away under the stars, you don’t want to find out three weeks before the big day that the venue has restrictions on equipment and noise. Before you sign any contract, have your itinerary ready and discuss it from start to finish. * Plan your equipment needs: One thing to know about holding a wedding in a less conventional spot is venues can vary wildly on what they can provide for you in terms of supplies and equipment. Take time to walk through the entire event so you’re clear on what you may need to supply yourself. Even if a venue lacks essentials like power outlets and bathroom stalls, don’t give up. There are affordable solutions out there to help you upgrade the space to a fully functional venue. Your local rental store, for example, is an essential stop for anyone planning a wedding. 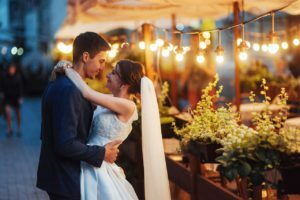 In addition to all the wedding gear you could need, from decorations to seating, they also have lots of other equipment and ideas to help you plan the perfect outdoor event. * Always have a Plan B: It’s impossible to predict what the weather will bring for an outdoor wedding, which can add uncertainty. But you can reduce the stress by planning for the worst conditions. Is hot and humid weather a possibility? How about a thunderstorm? A deposit on a rented air-conditioned tent and a set of misting fans can be a smart move. You may not end up needing these, but your peace of mind will be worth every penny. * Set up a kids’ station: Many outdoor reception spaces have a built-in advantage for hosting pint-sized guests: There’s more space for them to stretch their legs and be kids without disrupting other guests. Create a kid-friendly corner featuring games, activities or even a rented inflatable bounce house that lets kids be active and let off some steam. They’ll be thrilled (and so will their parents). 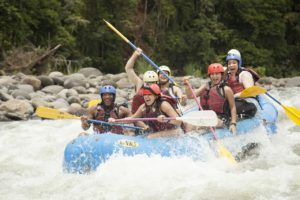 (BPT) – El Salvador, Central America’s smallest country, attracts a wide array of intrepid travelers who come to experience its vibrant culture and diverse outdoor activities. From its rich Maya history, to its volcanic beauty and generations-old artisan heritage, El Salvador provides plenty for travelers to explore. El Salvador is incredibly easy to reach from the U.S. and offers everything from ecotourism to culinary adventures at a fraction of the price of more well-known Central American destinations. There are regular direct flights to El Salvador from major U.S. cities, including New York City, Washington, D.C., and Los Angeles, and there is no need to exchange money upon arrival, as the U.S. dollar is the national currency. Here are five ways to make the most of a trip to El Salvador. 1. Kick back at the beach – There is no shortage of world-class beaches in El Salvador, with warm Pacific waters lapping on nearly 200 miles of coastline. Surfers flock to La Libertad for its renowned waves and international competitions. Those interested in learning to surf can find lessons for as low as $10. Along black sand beaches, travelers will find amazing seafood to enjoy while taking in magnificent ocean views. 2. Hike volcanoes and waterfalls – El Salvador is known as the “Land of Volcanoes” with 25 volcanoes visible to the naked eye. Many travelers combine a city tour of San Salvador with an easy volcano hike in El Boquerón National Park, just a short drive from the city. Local guides can navigate visitors up steeper volcanoes for half- and full-day trips. 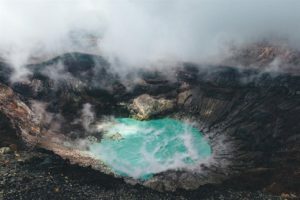 The country’s tallest volcano is Santa Ana Volcano in Cerro Verde National Park northwest of San Salvador where hikers will find moderate to difficult trails with a stunning turquoise crater lake at the top. 3. Get caffeinated on a coffee tour – El Salvador’s high altitude and tropical climate create the ideal conditions for growing coffee beans, and the country is known as one of the world’s top regions for specialty coffee production. Chances are that you have enjoyed java that originated in the mountainous region of El Salvador. A tour of El Carmen Coffee Estate gives visitors a closer look at the coffee-making process and provides the chance to taste some of the best coffee on earth straight from the source. 4. Get crafty with an artisanal immersion – Several of El Salvador’s small colonial towns are known for signature artisanal crafts that travelers can learn during their stay. Those that travel north from San Salvador to the quaint town of Suchitoto can make their way to the Arte Añil workshop and gallery to learn how to dye cloth with indigo as the Maya once did. Further north, the town of La Palma draws inspiration from the Maya to create the Arte Naíf drawing style. Visitors learn to paint with spontaneity without adhering to perfect proportions, creating bright and contrasting colored designs on locally harvested copinol seeds for a truly exotic souvenir. 5. Dig into the past with an archaeological site visit – Known as the “Pompeii of the Americas,” the UNESCO World Heritage Site Joya de Ceren provides a fascinating look at an ancient farming community that was buried in ash from a nearby volcano. A visit to the site and the nearby pyramids at San Andrés educates travelers on the lives of Central America’s original inhabitants who lived there as many as 1,000 years before Europeans arrived. With easy flight options, low prices for world-class experiences, and the ability to hike a volcano in the morning and surf in the afternoon, it’s not hard to see why El Salvador has become a hot destination for 2018. Kent County, Maryland is a special place for many reasons; be it the beauty of its waterways, the fruitfulness of its agriculture, the history of the land, or the quality of its people. It acts the home to many small businesses, offering the opportunity for business leaders to open their doors to the public and grow their services to fit the ever changing needs of the community. Justinian Dispenza of Andover Media, a Galena based media company, has shown how well a new business can both survive and thrive in Kent County. Hayden Chance and Aaron Maloney started Andover Media primarily as a service to aid musicians across Delmarva, starting off as a recording studio over five years ago. Two years ago Dispenza joined Andover Media, bringing along his extensive experience in photo and video services to the company. Chance and Maloney were both a part of a band, a deciding factor in their location, as oftentimes musicians would have to travel to metropolitan areas in order to record. They decided to support local artists with a space to grow their ability and credibility thanks to the recording studio meant to encourage Delmarva musicians. Dispenza’s addition was a natural one to maintain the growth of a business meant to support musical artists. Growing more, Andover Media has begun performing photography and videography for events such as weddings and other marketing projects. Currently a large portion of Andover Media’s business is performed in D.C., Baltimore, and Philadelphia, but Dispenza hopes to do more with locals here on the Eastern Shore in the future. While not all their work is local, Dispenza said Andover Media is keeping busy, having booked 60 weddings over the 2018 season. In addition to this Andover Media and Shore Studios have recently come together to complete a documentary for Washington College. Andover Media is striving to make connections with other local businesses through collaborative efforts, or networking events such as the Chamber’s own monthly Business After Hours. Andover Media has been recognized by both The Knot and My Eastern Shore Wedding for the high level quality their photos and videography have brought for several brides across the Delmarva area. The Eastern Shore is a prime wedding location, and Dispenza’s videos only serve to highlight the beauty of the area. (BPT) – Planning a wedding is no small task. In order to enjoy the process (and stay sane), it’s important to recognize early on which details can be decided quickly, and which ones deserve more time and care. When it comes to wedding photos, you can’t go wrong with a little extra time and thought, because there’s no such thing as a do-over. Choosing the right person for the job makes all the difference in getting that collection of photos you’ll treasure forever. When your special day rolls around, a professional photographer will have the skill and artistry in capturing those beautiful candid moments as well as the more formal portraits. Here are some traits to look for during your search that signal you’re in good hands. 1. A portfolio you love. Your venue may have a list of “preferred professionals” to choose from, but don’t feel obligated to stick with their list. Feel free to explore your options, and browse local guides and websites for the ones that have strong portfolios that speak to you. As you look, pay attention to mood, style and facial expressions. Skilled and experienced photographers should have a strong and varied wedding day collection. 2. They help you think through the day. A good listener who takes a genuine interest in your plans – and makes sure you feel elated with their work – is always a good sign. Things like venue, lighting, time of day, the number of people you want to capture, number of settings and the itinerary are just a few factors they need to consider to plan and organize the shoot. If you’re not sure about something, ask their opinion. 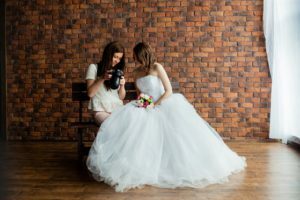 A professional will give you an honest assessment along with lots of suggestions so you enjoy your special day and capture those priceless images. 3. Something just clicks. And it’s not just the shutter. Bad puns aside, keep in mind you’re going to be spending the day with your photographer. In fact, you could very well be spending more time with the photographer than anyone else – even with your beloved. Don’t skip the in-person, face-to-face meeting when planning your special day. You want to be sure this is someone who makes you both feel open and relaxed, so trust your gut feeling. 4. They’re the complete package. A professional will complete the time-consuming (and sometimes overwhelming) task of sorting through hundreds of shots for you and put their skills to work in editing the images. What you should get is a collection of hand-picked images, all perfectly edited, cropped and toned, so they capture the best moments and emotions of the day. The one bearing the camera has a great responsibility: They are recording the first pages of history for your new family. To make sure you find the one that has the experience and the flair the day calls for, a professional photographer is always the right call. 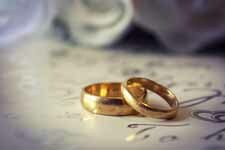 Start your search with the Professional Photographers of America by visiting FindAPhotographer.com/WeddingPhotos. (BPT) – In southern China, the ancient capital city of Nanjing beckons travelers to immerse themselves in history and culture. Nanjing served as the capital city of 10 dynasties and regimes over more than 1,800 years and is home to some of China’s most significant historical attractions, including the Xiaoling Tomb of the Ming Dynasty, Dr. Sun Yat-sen’s Mausoleum, the Presidential Palace and the City Wall, which dates back more than 600 years. Here, past dynasties are entwined with glittering modern skyscrapers. The misty Purple Mountain looms in the distance and the Ningzheng Ridge forms a crescent around this city in the heart of the Yangtze River delta. If you visit Nanjing, walk in footsteps of the past with these thought-provoking, immersive experiences designed to bring Nanjing’s history and culture to life. When you take part in the Imperial Examination Experience at Nanjing’s Jiangnan Imperial Examination Hall Museum, you will step into the shoes of an ancient Chinese civil servant. Beginning in the Han Dynasty (206 B.C. to 220 A.D.), citizens wishing to serve in the state bureaucracy were required to pass a rigorous government-issued examination. However, the test didn’t involve job skills. Instead, it assessed candidates’ knowledge of classic literature and literary style. .
During the three-hour Imperial Examination Experience, you’ll dress in traditional attire, learn to create Chinese calligraphy with a brush pen and make thread-bound books to take home as a souvenir. Few things are as closely associated with China as tea. Its long history as an indispensable part of daily life runs like a silk thread through everything from poetry to painting to calligraphy to medicine. Travelers seeking a deep exploration of tea can book the Chinese Tea Culture Experience in Nanjing. During this four-hour activity, you’ll see the stunning and peaceful Xuanwu Lake Park, formerly an imperial garden, before you disappear into a secret interior passageway in the Nanjing City Wall to find the hidden, speakeasy-style Lao Cui Teahouse. There, you’ll learn about the importance of tea in the Chinese culture from a tea master, who will guide you in the ways of brewing a perfect cup of tea. Finally, you’ll learn the ancient art of Chinese woodblock printing and create your own as a keepsake. Yunjin, meaning “as beautiful as a cloud at sunset,” is silk brocade exquisitely woven in a style dating back 1,500 years. Incorporating silk, gold and silver threads, and even peacock feathers, the fabric was once reserved exclusively for the ornate dragon robes worn by emperors. At the Nanjing Cloud Brocade Museum, the only one of its kind in the world, visitors can watch as artisans weave the brocade in the traditional style on self-powered looms. The craft is so intricate that the weavers produce only five centimeters of yunjin per day. Founded in 1994, Nanjing Impressions is a Top 50 Chinese Heritage Restaurant. It aims to preserve traditional Huaiyang cuisine, a popular and prestigious style of cooking in Jiangsu Province and one of the four great traditions of Chinese cuisine. The interior is designed like an ancient tea house, with hundreds of hanging lanterns, wooden benches and authentic dress for servers and chefs. The experience is vibrant, with servers shouting blessings as they pass traditional Nanjing specialties. Make sure to try the city’s signature dish of Nanjing Salted Duck, a 400-year-old recipe that involves a complicated procedure of brining and dry rubbing that produces a rich, tender bird. The Chinese believe a perfect meal consists of 10 dishes, so come hungry. Float lazily down Nanjing’s Mother River on a romantic evening cruise, and you’ll feel like you’ve traveled back in time to the city’s roots. Distant strains of guqin, a traditional Chinese stringed instrument, waft through the air as you cruise along the lantern-lit Qinhuai Scenic Area, with its quaint riverboats, footbridges and Chinese architecture including one of the world’s best-preserved Barbican gates. Ready to start planning your Nanjing experience? Visit gotonanjing.com for more information. (BPT) – Think of South Africa, and images of majestic savannas and roaming wildlife come to mind. A South African safari is an unforgettable experience, but no visit to the country is truly complete without a cultural immersion. The vibrant city of Durban combines the best of both worlds. Located along the Indian Ocean coast an hour from Johannesburg by air, Durban offers an eclectic array of activities where you can explore the city’s significant role in world history, the rich heritage of its Zulu people, and innumerable natural wonders – from the beach to the bush. Named for its dramatic surrounding landscape, the Valley of 1,000 Hills has been home to the Zulu people, South Africa’s largest ethnic group, for centuries. Visitors can take an organized tour deep into tribal lands to experience Zulu culture with its exuberant ceremonies, traditional music and dancing. You’ll learn about Zulu beliefs and healing practices, break bread with local families and learn the hidden meanings behind their colorful beadwork. 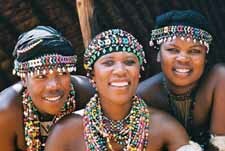 You can even arrange one-on-one sessions with the village healer or spend the night with a Zulu family in their home. Not everyone is aware that Mahatma Gandhi’s life work was inspired by his experiences in Durban. In 1893, he arrived as a young lawyer, and the discrimination he witnessed personally and against his fellow Indians drove him to start his worldwide movement of passive resistance fighting for the rights of the Indian population. At the Phoenix Settlement, you will see Gandhi’s house and the printing press he used to publish his newspaper, The Indian Opinion. Many of the more than one million Indians living in the city make the pilgrimage to this historical site alongside visitors from around the world. Five years after his death, Nelson Mandela remains South Africa’s most revered public figure. 2018 marks a year-long celebration of his life and what would have been his 100th birthday on July 18. Honor his work when you’re in Durban by visiting the Nelson Mandela Capture Site, at the exact spot where he began his “Long Walk to Freedom” after being arrested for anti-Apartheid activism in 1952. Visit the striking monument and educational exhibition walking you through Mandela’s life and role in establishing a democratic South Africa. Umhlanga Rocks, Durban’s laidback beach village, is on a picturesque stretch of the Indian Ocean. It beckons visitors with a scenic promenade passing by local landmarks including Umhlanga Lighthouse and Whale Bone Pier. A walkable downtown makes dining and nightlife easily accessible from the area’s many boutique hotels and guesthouses, and opportunities to get on the water abound – from surfing to deep sea fishing, scuba diving, whale watching and kiteboarding. Back on land, the South African bush is less than four hours away by car. Private game reserves offer high-end safari lodge accommodations, minimal crowds and optimal chances for getting the perfect photos of the “Big Five” – elephants, rhinos, water buffalo, lions and leopards. In iSimangaliso Wetland Park, a UNESCO World Heritage Site, hippos, crocodiles, pelicans and flamingos roam Lake St. Lucia, while elephants, giraffes and leopards inhabit the adjacent grasslands. (BPT) – If you’re planning a wedding or you’ve just tied the knot, congratulations! Getting ready to start the next chapter of your life with the one you love can be an exciting time, filled with anticipation about your future together. That said, combining two households can take considerable planning and preparation, especially if both parties own troves of treasured possessions. As you are getting ready to make the transition into a single house or apartment, consider how the following suggestions may make your move easier. * Pare down possessions. After unwrapping your wedding gifts, take an objective look at your collective furniture, household goods, clothing and other items. Where do you see duplicates? Whose décor are you more likely to use? Are those old clothes you’ve had since high school really worth keeping? Now is the time to be generous in donating unneeded items to a local charity (or selling them on Craigslist). * Nix the shopping blitz. Although those wedding checks and gift cards are burning a hole in your pocket, postpone your purchases until after you move so you don’t end up needlessly hauling them to your next locale. * DIY on the moving. Rather than shelling out a small fortune hiring a moving company, simply rent a truck that you can drive without a commercial license. As a rule of thumb, seek 150 cubic feet of space for the furnishings of each room in your present house; that means a 12- or 16-foot Penske rental truck should accommodate the contents of a small apartment or condo. Remember to reserve your truck at least two weeks ahead, and ask for the discounts provided to AAA members and military personnel. * Invest in packing supplies. This is not the time to skimp by using flimsy containers, newspapers and cheap tape to pack up your treasured belongings. Save yourself time and frustration later by picking up sturdy boxes, labels, tape and bubble wrap from your truck rental store so you can ensure everything arrives at its destination safe, unbroken and easy to unpack. * Party on. Inviting friends and family to help you with your move can be a win-win for all; many hands make light work when it comes to loading and unloading your truck, and you can offer incentives by springing for pizza and beverages at your new home afterward. * Learn how to load. Apply logistical strategy to filling up your moving truck, perhaps by following the guidelines offered by Penske’s Truck Wizard. In general, heavier items should go in the back of the truck, with lighter items in front and on top. * Practice makes perfect. Driving a moving truck isn’t difficult, but it’s definitely different from driving a car or pick-up. Take time to familiarize yourself with those differences; for example, you must use your mirrors to navigate turns, you should avoid sudden stops or lane changes and give yourself extra time. Need more information about the advantages of renting your own moving truck? Check out PenskeTruckRental.com for details.